If you use Gmail to get the Affaircare Newsletter…you need to read this! 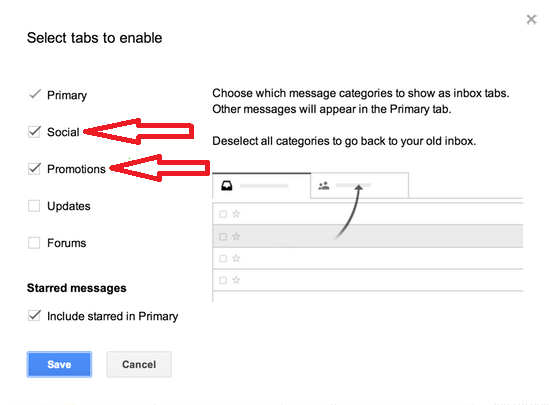 Last week, Gmail made some changes to your inbox that you may not have even noticed. Gmail added “Category Tabs” to the inbox. Now, their plan was that emails that match certain criteria would be automatically sorted, so your inbox is easier to manage. Sounds kind of nice, right? What do these tabs mean? Well…Gmail decides FOR YOU, rather than allowing you to decide or filter. Forums is supposed to filter emails relating to groups and forums–for example, your mailing list subscriptions. Social groups all social networking messages together (surprise, right?). Updates tab gathers emails that Gmail thinks are receipts, bills and statements. The Primary tab is the catch-all for other emails. But the one that’s a little wonky is the Promotions tab. Promotions is fairly self-explanatory, you’d think — it’s all of your offers, marketing mail, etc. And these Category Tabs might be cool, if Gmail had allowed us to customize tabs for ourselves–like filter what does or doesn’t go into them, or make our own like a “Family” tab. That would be GREAT! But sadly that’s not how it works! These are the only five tabs we can have, we can’t choose what goes into them or even rename them! That means, our weekly newsletter full of content you want because you want to save your marriage after an affair, will be featured alongside spammy marketing emails!! That is so uncool! People who opted in to our mailing list — and double confirmed their email — may not get our newsletters because Gmail decided to but up this wall between Affaircare and our community! Now we know you like the updates we share — which is why you’re on our list. You also know that our goal has always been to provide wise, godly content that will help you save your marriage. Plus, it’s not like we spam and bother people who don’t want anything to do with us; we respect our community and if you ask us, we email you. We are POSITIVE you don’t want to miss out on emails like our newsletter or the Respect Dare daily email, letting you know something that can either make – or break – your marriage after an affair. So if that’s how you feel, we’ll show you what to do so you don’t miss out on emails from us. Then you’ll revert to the traditional, much BETTER Gmail inbox where YOU are in charge of seeing every single email! YAY!! Step 2: Find an Email from “Cindy and David at Affaircare” in your inbox. You can do ‘Control+F’ for Find, and then search for our name. Thank you for caring about Affaircare and wanting to share in a community that helps couples recover after an affair!